I didn't expect to like these boots, but I do. A lot. I didn't expect to like these boots, but I do. A lot. They are constructed such that they feel like they're wrapped around my feet. The footbed is plush. 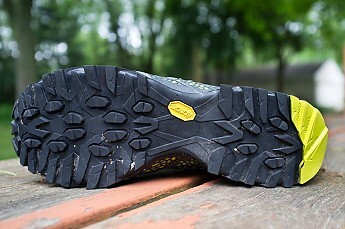 The stiff Vibram sole and shoe construction provide for a very stable shoe. 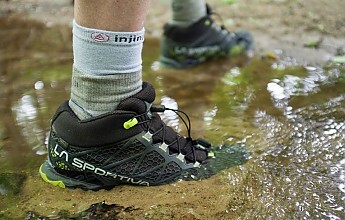 The new Gore-Tex Surround lives up to the promise of being waterproof with sufficient ventilation to keep my feet dry. I fully expect them to live up to the promise of being suitable for hiking all types of terrain, with light packs, or as bomber trail runners. They're fairly expensive and hard to find. The Company: La Sportiva is an Italian company that has been making boots and shoes since 1920, and in WWII they began making mountaineering boots for soldiers. They have a long history of excellent craftsmanship and innovation, and a great reputation among mountaineers, trail runners, and long-distance hikers. The boot employs a perforated footbed that sits atop a foam spacer that effectively pumps moisture out thru the side vents every time you step. Combined with the AirMesh/Nano-Cel upper, it promises waterproofness with breathability and imperviability to dust, dirt, or sand. 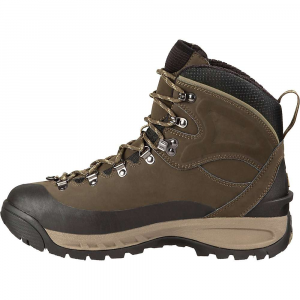 Backpacker Magazine gave these boots an Editor’s Choice Award in 2015, stating they had the best application of this technology they’d seen that year. 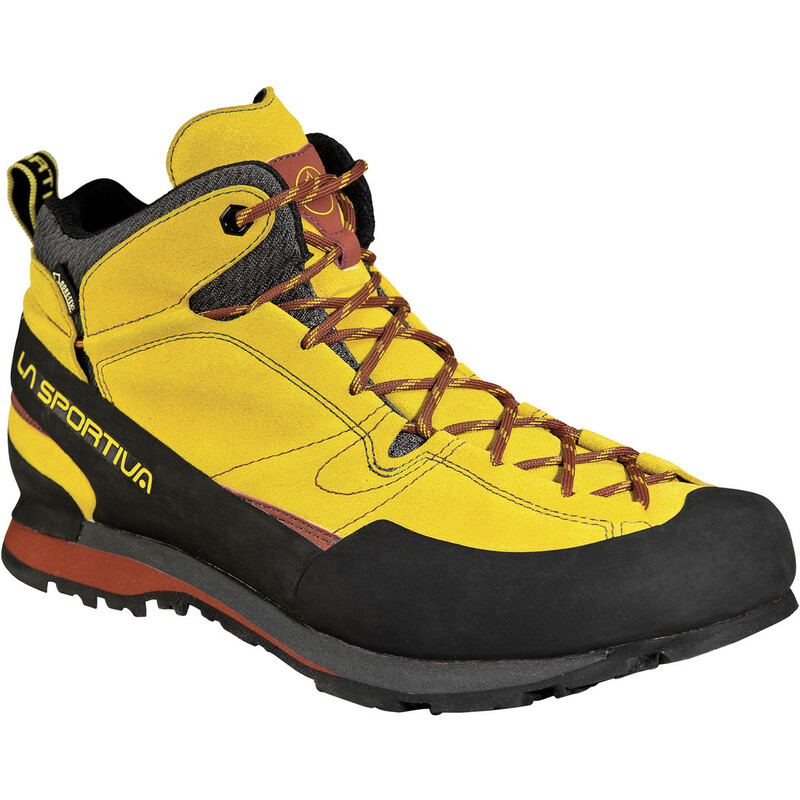 The Boot: La Sportiva calls these a mid-cut, versatile hiker with highly breathable Gore-Tex Surround technology, designed for moving fast on all types of hiking terrain, and with light packs off-road. They are available in both men’s and women’s versions, and are part of La Sportiva's Mountain Hiking range, along with the high cut Core GTX and the low-cut Primer GTX. All three share the same looks and technology. The uppers are their AirMesh / Nano-Cell design, lined with Gore-Tex’s new Surround. The midsole is constructed of compression-molded EVA with TPU inserts. They sport Vibram Nano soles with Impact Brake System lugs in the heals oriented to increase braking power and decreases impact forces. Single pull laces with one speed-lace hook. Tongue gusseting is done with mesh panels. 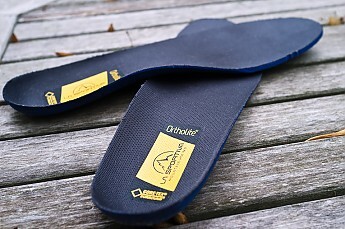 They feature Ortholite insoles, and large, padded cuffs around the top to help keep dirt and debris out. The company’s “STB Technology” provides stability and torsional rigidity by wrapping the midsole and unifying it with the upper for a locked-down fit. The Reviewer: I'm a lightweight backpacker, generally carrying 30 lbs with food and water on five day trips. Over the last few years, I’ve hiked 1,560 miles of the AT in long sections, mostly wearing Merrell Moab trail-runners, but also Salomon Fastpackers and Asolo Piumas. I have a fairly wide fore-foot, a narrow heal, medium to low fore-foot volume, and mid to low arches. So I look for a boot which doesn’t pinch my toes together, while cupping my heal enough that it doesn't slip when I walk. I am inclined to to not wear waterproof boots on long hikes. In my experience, they tend to get hot in summer, and when they get wet, they stay wet. I generally prefer a boot that breaths freely and dries quickly. I do wear waterproof boots snowshoeing, or on trips of a few days or shorter where I expect wet conditions. But this is new technology, so I’m excited to give them a shot. Testing: For the last 7 weeks, I’ve been wearing them in my daily routine, walks on sidewalks, and day hikes on the trails around Western Michigan. On the day hikes, I wore both day packs, and a 50L pack loaded with 16-30 lbs of gear, food and water. The trails were in back-dune country along the shore of Lake Michigan. Lots of wooded trails with short, steep ascents and tread ways ranging from soft dirt to deep sand. With little rain during the period, I wore them along a stream bed, crossing it several times in increasingly deep water. Fit: The fit on my feet is really good. The last, insole and uppers seem to wrap around my feet seamlessly. The toe box, while not the widest in my closet, allows my toes to lay naturally, without excessive compression, and my narrow heal is cupped … pretty well. I wish they were a bit tighter, and those speed laces are gonna make a heel-locking lace challenging at best. But I’m being picky, and I have skinny heels. YMMV. Those requiring a high volume shoe might need to look elsewhere. The fit got better over time, so expect some minimal break-in period. Impressions: These shoes are very comfortable. Part of it is that they fit my foot profile pretty well. The footbed is very comfortable, with fairly plush cushioning — No doubt a side-benefit of the perforated footbed and foam spacer that’s part of the Gore-Tex Surround system, coupled with the Ortholight foam insoles. The sole is not as flexible as my other boots. I appreciate the added support they provide, and the ability to edge the boots on those toothy lugs along the edges of the soles. I expect them to be more comfortable and supportive on rocky trails than the other boots I’ve worn. Combined with the Air-Mesh upper, I feel I have both excellent support, and protection for my feet, even when scrambling with a 30-lb pack on my back. That Vibram sole sports aggressive lugs that provide outstanding traction. 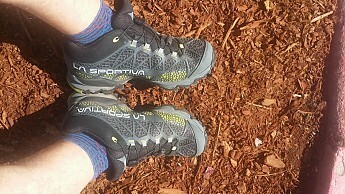 I haven't yet worn them on slippery rock, but I felt very confident scrambling in sand and loose dirt. That upper does make it look like one's wearing some kinda snake-skin boots. But those small honeycomb cells provide structure while allowing for transpiration without constraints. They’re a big reason these boots breath as well as they do. The one-pull” fast lacing system makes them quick to get on and off, and the single speed lace hook is a novel way to open them up. But for those of us who like to employ alternative lacings for specific situations, these boots ain’t gonna do it with out some modification. The low-cut Primer and the High-top Core versions have traditional lacing. Hiking the sandy trails of dune country, I am used to pouring copious amounts of sand from my non-waterproof trail-runners. After several hikes that took me through deep sand, the worst day yielded no more than a few grains. 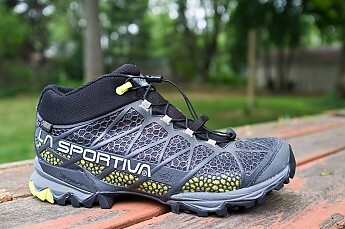 La Sportiva's AirMesh/Nano-Cel uppers pretty well meet the promise of effectively blocking sand and dust intrusion. I spent some quality time walking thru streams, and had no water intrusion till the water got up to the level of the tongue gusset at the lowest eyelets. My foot was that deep for a few mins while taking pictures, and I had only a bit of dampness on my outer sock. We have not had a very warm spring. Many of us wondered whether it would ever come. So I have not yet experienced how these shoes perform in hot temperatures. I have been hiking in temperatures in the low 60s, to high 70s. My feet have been warm, tho not uncomfortably so, and I did not have damp, sweaty socks at the end of the day. Cost & Availability: At $180 msrp they are not a casual investment. I would consider the cutting-edge design and technology they successfully integrated into these shoes, and the craftsmanship with which they put it all together, and consider that a fair price. If you can find them. 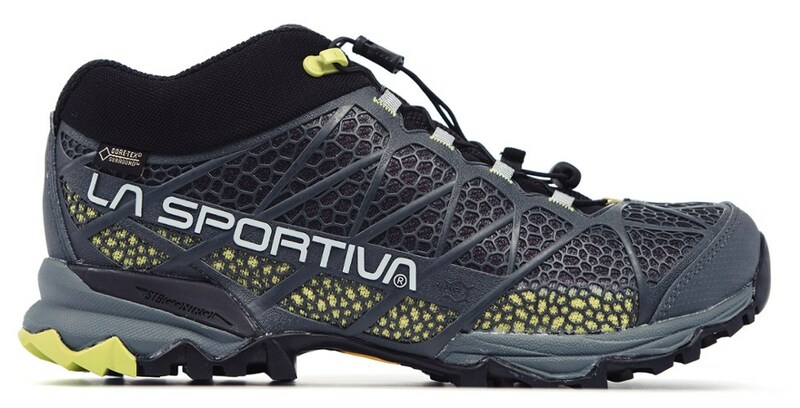 These shoes are new for 2015, and since they won Editor’s Choice Awards by both Backpacker Magazine, and the German magazine Outdoors, La Sportiva has had trouble meeting demand. Hopefully they'll pump up production in the near term. If you don’t buy that, or if you would prefer a lower or higher-cut shoe anyway, I’d expect the Primer and the Core to function the same as the Synthesis. Going Forward: As soon as I get this posted, I’m putting these boots on, grabbing my pack, and heading for Vermont to hike the AT to Harpers Ferry, WV. That will give me ample opportunity to test how they perform on the rocky terrain of Northern Pennsylvania, how they feel in the heat of the summer, and how long they take to dry after getting soaked inside and out! 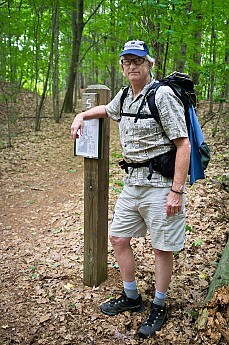 Look for me on the trail this summer, and for my update in September. Thanks for a great review, and pics, Bill. Have an awesome section hike. We'll be curious to hear your long-term opinion once you're back. 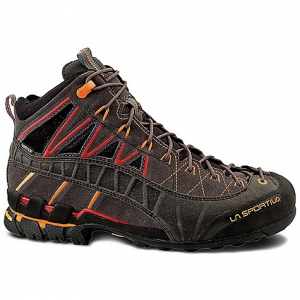 I need some new hikers and have done well with La Sportiva, so these will go on my short list. Great photos, Bill. Very helpful in showing what these new kicks are all about. Looking forward to hearing how they perform on the AT. Thanks for your detailed review Bill, and hike safe! A Gore-Tex boot can be overwhelmed by a stream too deep or a day-long rain that drips down your legs into the boots. Did that ever happen with you, and if so, how long did it take for them to dry out? I've been able to walk non-GTX Salomons dry in a relatively short time, but some people find that GTX boots and shoes take forever to dry out. 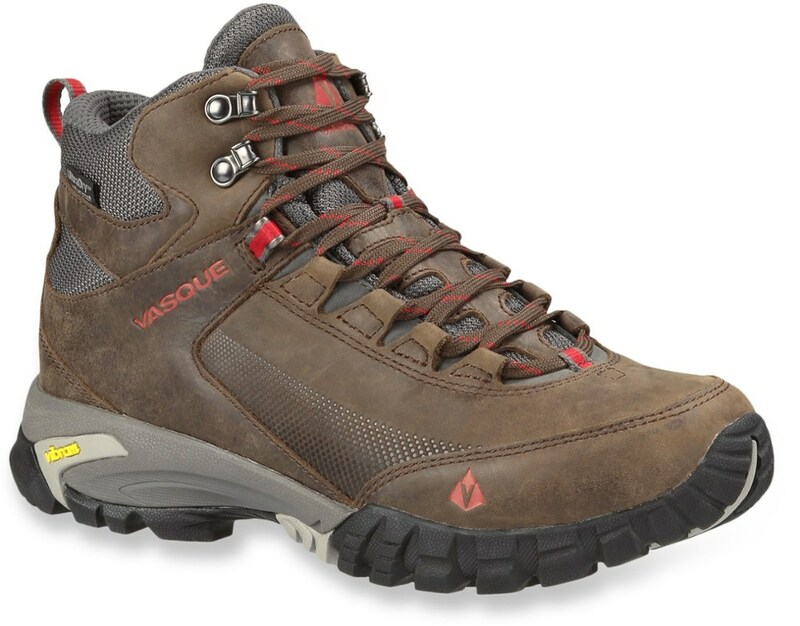 Excellent lightweight hiking shoe that is a great breathable shoe for damp /wet conditions. Could have a wider last for more lateral stability. 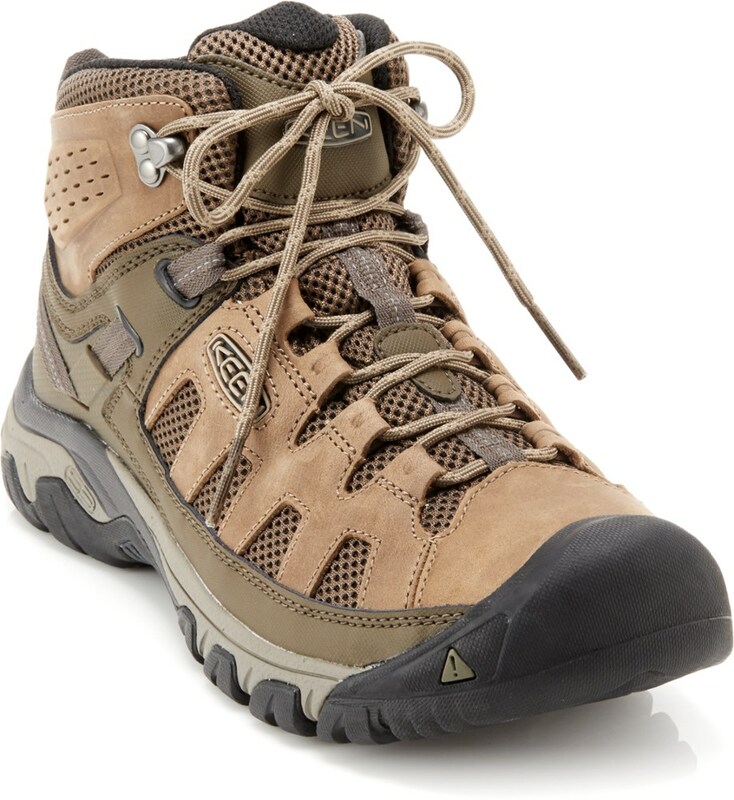 I was looking for a good day hiking shoe for some local trails in the Mission Gorge area here in San Diego. I tried these on and were surprised at how lightweight and comfortable they were for the task. Not like the other bulkier, heavier hiking shoes I've worn and tried on. 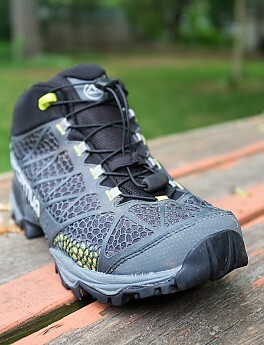 But I was skeptical about how they'd perform, particularly with this new GoreTex lining. To my surprise they were great, very comfortable with sufficient stability for the task. I went through a shallow portion of the San Diego River several times during my hikes and each time my feet remained dry and they were not hot or sweaty. The shoe was comfortably cushioned and had great traction in all types of terrain—cambered, scree, hard packed dirt, etc. The lacing system works well to lock down your foot and create a secure fit without the fear that your foot will slosh around. Very responsive. My only complaint was that the last/outsole could be a bit wider to make the shoe more stable laterally. Nonetheless, I continue to enjoy this shoe. It's great to go on a long hike and not have my feet hurt, not have any hot spots, and have them remain bone dry. Thanks for the review, JJB. Whilst I have to agree they are very comfortable, they are not that well made. Whilst I have to agree they are very comfortable and the Gore Tex liner keeps feet dry their durability is suspect. The welding holding the sole to the boot came apart whilst on a hike. This was after not being overused and even though there was a lot of wear left in the sole. My other boots have lasted me far longer than these. Thanks for the review, bikepacker. Too bad about the shoes. Did you contact La Sportiva for any customer service? Also, if you're able to add a picture of your shoes to your review, it would be helpful for others to see its issues. Are you kidding me?! That was my reaction when I got home today after putting in miles in 103-degree heat. Pulled the boots off and my socks were dry as a bone! NO SWEAT whatsoever, this with a Gore-Tex liner? In case you are wondering, I wear the Smartwool PhD Run Elite socks. I have yet to test out water permeability, but that will come soon enough here in Portland. Now to the comfort, UNBELIEVABLY COMFORTABLE! In fact, the most comfortable boot I have ever had the pleasure of putting on my feet. And they were comfortable immediately. The boot hugs EVENLY across the top of the foot as you walk, without a single pressure point or hot spot on either foot. The boot tensions very evenly around the entire foot. This is so rare to find in a boot. The insole and the boot itself really works its magic in shock absorption with every step, and just today I was forced to run flat out for about a 1/4 mile, PURE JOY. Next, weight, these boots are FEATHER LIGHT, and they feel that way, really easy on the legs and feet after miles and miles. 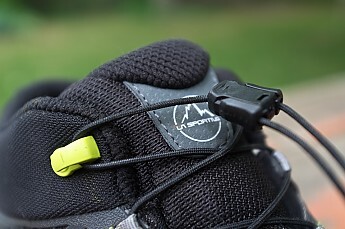 Now, onto the what La Sportiva terms as their brake system. Let me tell you, this is not ad hyperbole, this system WORKS. The traction is the best traction I have ever gotten out of a boot. Period. So, all in all, this boot deserves 5 stars, wish I could give it more! 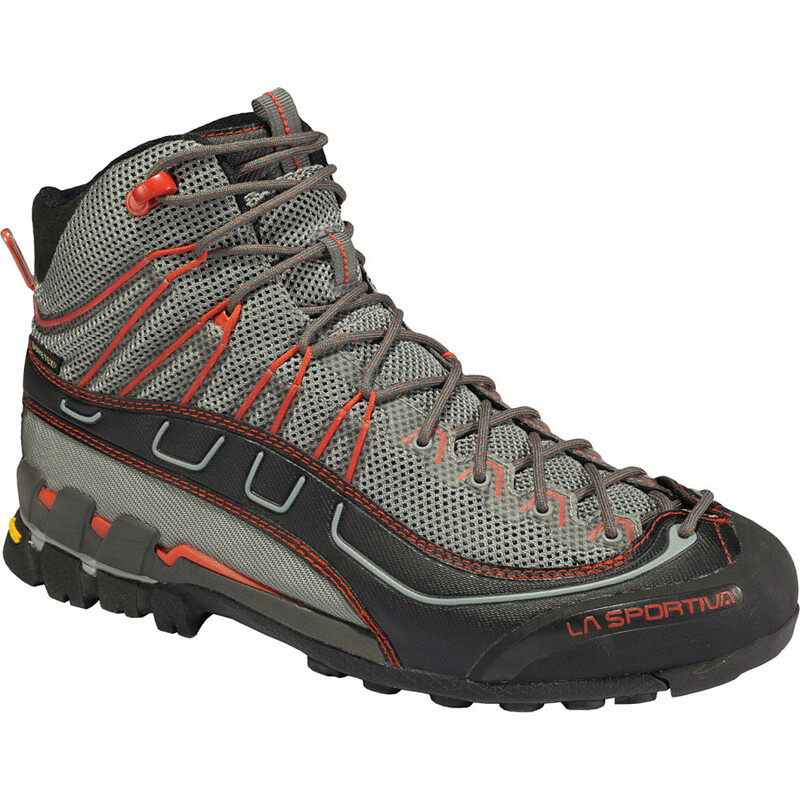 I sure hope La Sportiva does not discontinue this boot, I am thinking of buying another pair just in case. For sizing, I find them standard. I had to go up just a half size from my walking shoe size. Plenty of room in the toe box, and I have wide feet. I am also a huge fan of speed laces, and here the Synthesis boot does not disappoint. So, there you go...get a pair and put a real smile on your face! 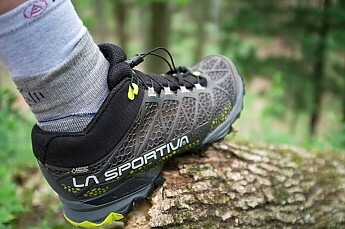 Thanks for the review of your La Sportivas, pnw_beagles. I hope you'll keep us posted on how they continue to work out for you.